Syniverse recently contributed to a new LTE milestone by collaborating with an American operator and Japanese operator to enable the world’s first transoceanic VoLTE (Voice-over Long-Term Evolution) roaming call. The project marks an important step in the mobile industry’s rollout of VoLTE that will pave the way for quicker and more efficient VoLTE roaming implementation worldwide. The transition to LTE involves a number of challenges, as complex kinks are worked out, new equipment is installed, and mobile devices are made with the necessary hardware. A core component of this transition has been enabling VoLTE roaming, which requires testing, resolving and ensuring the quality of a number of new processes among different operator networks in different geographic regions. In working with an American operator and Japanese operator to implement VoLTE roaming, our network team at Syniverse’s North American and Asian test labs used Syniverse’s IPX network to work with the operators in a series of trials to route multiple calls across the Pacific Ocean and back. The trials took place over approximately six weeks and were based on an S8 Home Routed (S8HR) architecture over Syniverse’s IPX network. S8HR is a technology based on an existing LTE data roaming platform that allows for rapid deployment of VoLTE roaming for those operators that have already launched LTE data roaming. In addition, the VoLTE roaming solution we developed was also designed to allow operators to implement VoLTE roaming using local breakout (home public land mobile network or visited public land mobile network architecture), as well as VoLTE interconnection through the Syniverse IP Services Hub. 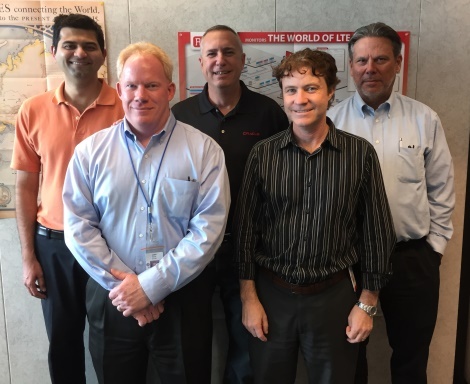 Some members of the Syniverse network team that led the transoceanic VoLTE roaming call project: (from left) Prashant Datar, Dave Smith, Bill Gottlieb, Brian Beach and Ken Hammer. Other key individuals on the team not shown include Faron Achziger, Mike Furey, Vincent Raven and Jeffery Shi. The project was an extremely rewarding experience for our team to be a part of, and we look forward to helping the mobile industry build on this first transoceanic VoLTE roaming call with other VoLTE roaming connections. As LTE becomes the new standard, mobile users will increasingly expect access to the same high-speed experiences all the time, wherever they go. The achievement of this transoceanic VoLTE roaming represents a critical step in ensuring that the mobile industry delivers on this expectation. In the video below, I answer a few questions to shed light on some of the most important parts of the project. Please watch and let me know your thoughts. Do you use LTE now, and do you look forward to having a continuous LTE experience when you travel abroad?